For the last three decades, Landsat spacecraft have collected specialized digital photographs of the Earth's continents and coastal regions. Scientists and researchers use these images to evaluate dynamic changes in our environment, both natural phenomena and changes caused by human activities. Originally known as Earth Resources Technology Satellite Program, the Landsat Program was inspired by photographs of Earth taken by Apollo Moon missions in the 1960's. While weather satellites were already monitoring Earth's atmosphere, they were not designed to collect terrain data. The express intent of the Landsat Program was to use orbiting spacecraft to study and monitor the earth's landmasses. The Mercury and Gemini projects had previously proven the feasibility of the project, and the usefulness of orbital photography to earth scientists. 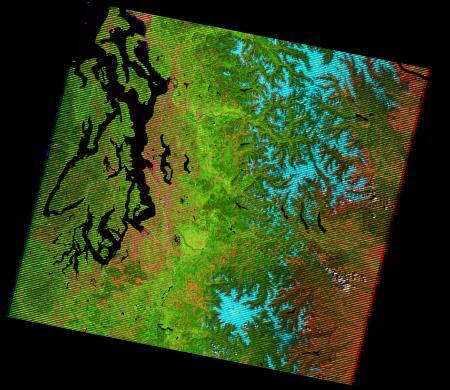 The Landsat Program came to fruition when Landsat-1, the first unmanned satellite specifically dedicated to multispectral remote sensing, was launched on July 23, 1972. Landsat-1, a joint effort between NASA and the USGS, was the 1st in a series of 7 (to date) earth-observing satellites providing continuous coverage of most of the Earth's surface. Today, 2 of these satellites are still in operation, Landsat-5 and Landsat-7. Landsat-1 outlived its design life by five years, operating until January 1978. This exceeded all expectations, as did the quality, and impact of the data collected, 300,000 images of the earth's surface. Landsat-2 and Landsat-3 were both still considered experimental projects when launched in 1975 and 1978 respectively. However, in 1979, due to the program's technical and scientific success, Operational status was declared, and operational responsibility was moved from NASA to NOAA. Landsat-4 and Landsat-5 were identical spacecraft, both built at the same time, but were launched separately, in 1982 and 1984. After the launch of Landsat-5, Congress passed the Land Remote Sensing Commercialization Act which allowed privatization of land satellites. Because of this Act, NOAA passed responsibility for current Landsat data and resources to Earth Observation Satellite Company (EOSAT). EOSAT was also contracted to build, launch and operate Landsat-6 and Landsat-7. EOSAT failed to make a successful commercial business out of the Landsat program. In order to create a profit, image prices were raised 600%, which drove away many customers. Without these customers, many imaging opportunities were missed, creating a gap in continuous earth coverage data. In addition to the poor business, the calibration and characterizations of Landsat-4 and Landsat-5 lapsed under EOSAT control. In 1989, NOAA (who still provided financial backing for the Landsat program to EOSAT), ran out of funds and directed that Landsats 4 and 5 be shut down. This did not happen, as Congress provided emergency funding for the rest of that year. This scenario was repeated in 1990, 1991, and 1992, but by the end of 1992, EOSAT stopped processing Landsat data. The value of the Landsat Program was recognized by the United States Congress in 1992 when it passed the Land Remote Sensing Policy Act authorizing the procurement of a government owned and operated Landsat-7, assuring the continued availability of Landsat data, at the lowest possible cost, to traditional and new users of the data. This effectively transferred the responsibility for the future of Landsat from EOSAT back to USGS. Landsat-6 was launched by EOSAT in 1993, but the satellite failed to achieve orbit. With Landsats 4 and 5 both beyond their design lives, the loss of Landsat-6, and the Landsat-7 program being so young, it seemed that a data gap was inevitable. However Landsat-5 continued to operate well beyond its designed life. Launched on April 15, 1999, Landsat-7 was designed for a 705 km, Earth mapping orbit with a repeat cycle of 16 days. Its payload is the Enhanced Thematic Mapper Plus (ETM+), a single nadir-pointing instrument which provides for an eight-band multispectral scanning radiometer capable of providing high-resolution image information of the Earth's surface. Designed to collect, filter and detect radiation from the Earth in a swath 185 km wide as it passes overhead, the ETM+ produces approximately 3.8 gigabits of data for each scene. Landsat-7 imagery is used extensively in many diverse applications in such areas as agriculture, forestry, geography, geology, global change research, mapping, oceanography, resource management, and water quality. The most common use of Landsat data in popular culture is seen when the largest parts of the earth surface are displayed on web mapping services like Google Maps/Google Earth, MSN Maps or Yahoo Maps. These large area displays are based on enhanced and color balanced Landsat-7 imagery. NOAA joined the International Charter "Space and Major Disasters" in September 2001, and the USGS joining later providing Landsat data to assist in international disaster recovery efforts. Landsat-7 images of New Orleans, Louisiana, captured just months prior to Hurricane Katrina, and then again one day after Katrina made landfall, show dramatic differences in waterlines, as seen in the graphic below. 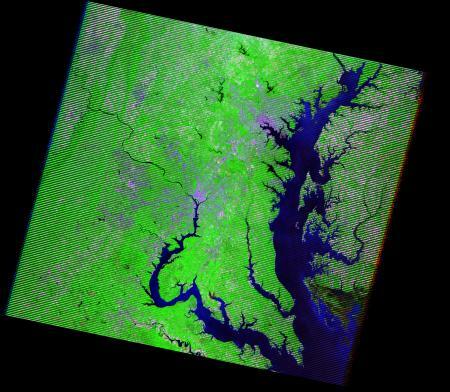 Landsat-7 data products are available from the USGS Center for Earth Resources Observation and Science (EROS). These products are distributed at COFUR prices or "the Cost of Fulfilling User Requests". This is a significant price reduction from commercial data sales, allowing renewed use of Landsat data in academic institutions for scientific research. This has stimulated the use of multispectral imagery in a variety of applications, fostering new uses not only for Landsat data but for other remote sensing data as well. As of June 4, 2007, the USGS has been releasing selected Landsat 7 image data of the United States through the Web. These data are of high quality with limited cloud cover. The next-generation Landsat, known as LDCM (Landsat Data Continuity Mission, is expected to be launched in the summer of 2011. The USGS will be responsible for the mission operations, along with collecting, archiving, processing and distributing the data to the U.S. Government and other users.